Pioneer Bank welcomes you to our banking community! Pioneer Bank opened its doors on February 18, 1901 as the Roswell Building & Loan Association in Roswell, New Mexico, to meet the need for capital to finance home construction. Over the past 110 years, Pioneer Bank has grown into the area’s number one community-based institution for business and personal banking. We are committed to being a good corporate neighbor by engaging in sound and ethical business practices and by giving back to our community. We have offices in Roswell, Carlsbad, Hobbs, Ruidoso, Roswell and Las Cruces, New Mexico; El Paso and Midland, Texas; and Glenwood Springs, Colorado. We are proud of the communities we live in and work hard to help you reach your financial goals. Being a community bank, we are better able to serve our customers and neighbors by offering a unique banking experiences – where customer service comes first. A strong and genuine belief in the “customer for life” principle of doing business is what fuels Pioneer Bank. Referrals from previous customers and local real estate professionals have always delivered the majority of our production. To get started: Stop by any of our locations, or contact us. Tammi, this site is our blog, for news and information. 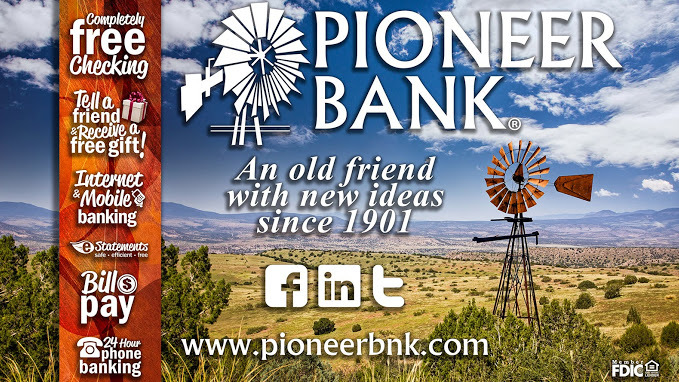 To log in to your online banking you need to visit http://www.pioneerbnk.com. We apologize for the inconvenience.